» Archived Review: MARY McMULLEN – Welcome to the Grave. Archived Review: MARY McMULLEN – Welcome to the Grave. MARY McMULLEN – Welcome to the Grave. Detective Book Club, hardcover reprint (3-in-1 edition); May 1979. 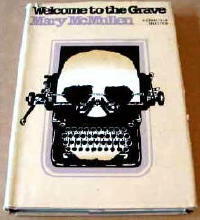 Hardcover first edition: Doubleday Crime Club, 1979. US paperback: Jove, 1989. 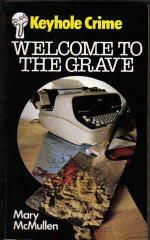 UK hardcover: Collins Crime Club, 1980. UK paperback: Keyhole Crime, 1981. There is a knock on the door. Harley’s wife, who had run off with a gallery owner, has returned. He’d never divorced her, and now he can’t get rid of her. There is a secret, an accident, a dead child, and she is the only one who knows about it. If ever there was an author proficient in domestic (suburban Connecticut) malice, it was Mary McMullen, who wrote nearly a score of similar mysteries, mostly in the 70s and 80s. There is murder about to happen, and the only questions are: when is he going to do it, is he going to get away with it, and how? McMullen is also very witty, and she jabs the socio-economic pretensions of the lower corner of the state quite nicely. But she also seems to lose her way after a third of the way through, and she allows Harley’s grandiose plans to fizzle away in a largely mystifying manner. It leads to an unsatisfactory and (upon some reflection) rather unpleasant conclusion. [UPDATE] 06-22-08. It’s over six years later, and for the life of me, I do not remember either the ending of this book or what I found in it to be displeased about. Either way, I don’t believe there are many authors today who write with the same kind of domestic malice in their books as Mary McMullen did, along with a number of female authors of the 1950s, 60s and 70s, such as Ursula Curtiss, Genevieve Holden, Margaret Millar and others. They didn’t necessarily write noir fiction, but there was a lot of bite to their books. I read Margaret Millar and Ursula Curtiss but somehow McMullen got by me. I love domestic drama-have to look her up. Her books would go well on Forgotten Fridays, that’s for sure. I’d have saved this one for this Friday, if I’d liked it better. But if you enjoyed Millar and Curtiss, I think you’ll get some pleasure from McMullen too.